In addition to the large trench at the Abbey, we also excavated a narrow trench in the field just to the south, between the St. Columba Hotel and the eastern shore. 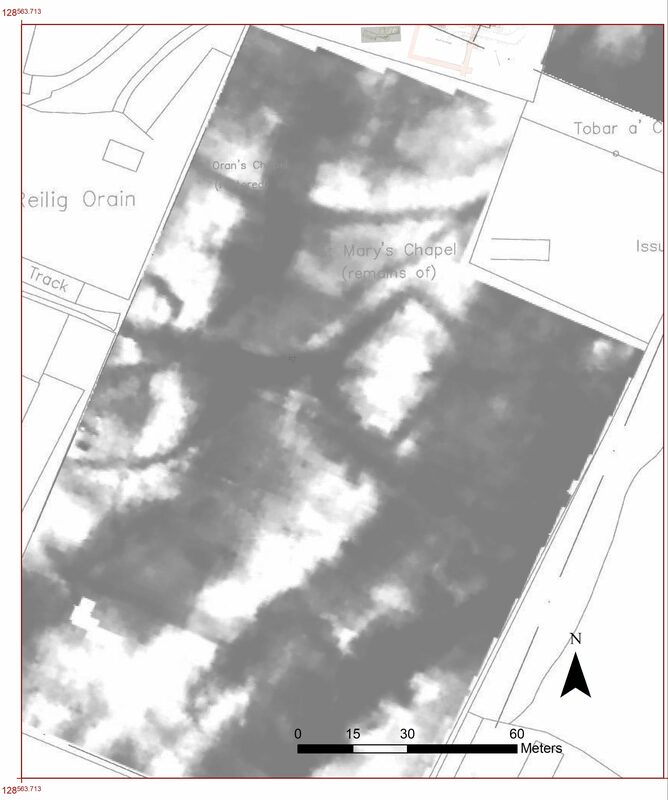 Geophysical survey in this field in 2012 discovered a strange, rectangular feature with rounded corners measuring roughly 40 x 30m. We thought it might be a ditched enclosure, but the shape is unusual for this area. It also wasn’t clear that the structure was associated with either the early monastery or the Benedictine abbey, as it lies outside the Abbey’s outer perimeter. Geophysical results showing a rectangular feature just south of St. Marys Chapel. To try to understand this structure a bit more, we opened up a 7 x 1.5m trench on the southern side of the structure, where it was cut by a trench for a now disused water pipe. The feature was indeed a ditch, and we found a fair amount of medieval pottery and some evidence of iron working. Further down the ditch was a stone setting of largely local granite. The stones looked very similar to those used in St. Mary’s Chapel and were probably taken from it, most likely after the Reformation in the mid-16th century. We’re unsure as to the use of such a structure at the bottom of a ditch, but we think it may have been used as a causeway across a particularly boggy portion of the ditch. Shortly after uncovering this stone setting, the soil became increasingly silty and eventually we hit the water table at the base of the ditch. The excavated ditch trench, looking east. So the structure is indeed a ditched enclosure, and likely dates to the later medieval period, given the finds. Aside from that, however, its function is unclear. It may have been used for craft working of some kind, given the presence of iron working evidence, but the finds are somewhat sparse. The ditch could also have been used for drainage, as this field continues to be rather boggy, but there was no evidence found for that either. For now, then, the structure remains yet another mystery, but samples of charcoal from the base of the ditch should allow us to date it more accurately. So exciting for those of us who live on Iona, great work ! Previous Previous post: Day 26: What was our mysterious early building? Next Next post: 2018 Iona Excavations – Now Online! 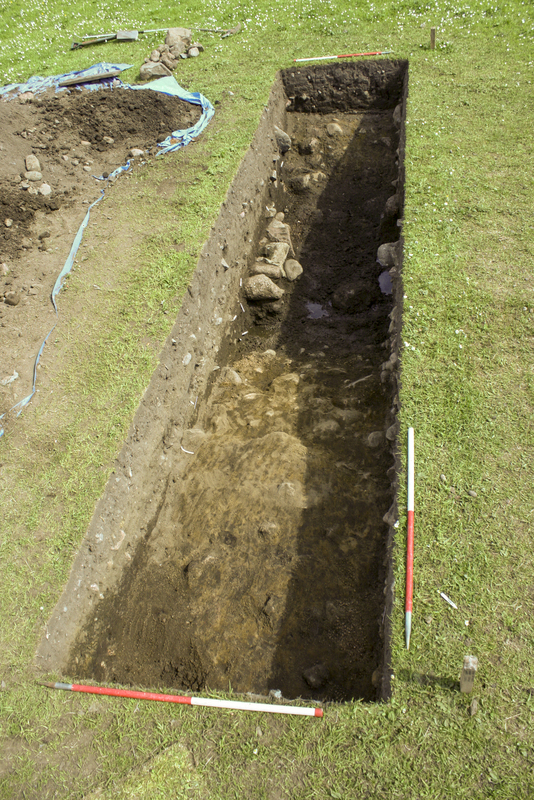 2018 Iona Excavations – Now Online! Day 26: What was our mysterious early building? Day 25: That’s a Wrap! This work by Iona Research Group is licensed under a Creative Commons Attribution-NonCommercial-ShareAlike 4.0 International License. Based on a work at http://ionaresearchgroup.arts.gla.ac.uk/.